Farmer Jack is perhaps Aspen’s most hardworking, honest champion of local food. Year-round, he collects the bounty of more than 50 regional farms in the Paonia heartland, driving two-plus hours each way to Aspen and Carbondale to sell this fresh produce to chefs and to the public in his back-alley CSA-box delivery program. 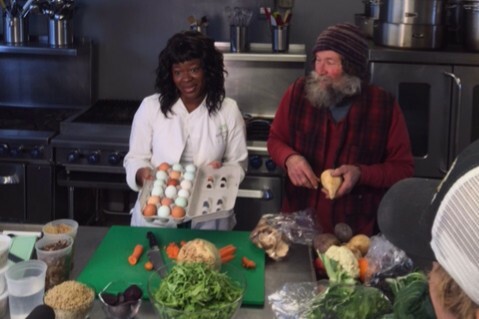 A passionate former farmer, steadfast educator, and longtime local, Jack works tirelessly to bring homegrown fruits, vegetables, herbs, and locally sourced eggs, meat, dairy, honey, and other artisanal goods to the people of the Roaring Fork Valley at prices far more reasonable than the farmers’ market. Experience delicious cuisine, meet new people, and share a special evening with friends and family at Mawa’s Kitchen. Under the tutelage of our Chef, you will learn to prepare an unforgettable meal from the day’s bounty of the farms in the valley and surrounding areas. Farmer’s Jack’s fresh, locally grown ingredients take the starring role in these multi-course dinners, which spotlight the strong links between community farming and the pleasures of eating. Guests will enjoy a 4-course meal and wine in our beautiful private dining room. The amazing food and our unparalleled service are the ultimate in private chef dining. Come with an open heart and partake in the art, creativity and joy that Mawa’s Kitchen brings to an evening of great tastes. Eat, Laugh, Drink, Connect! Limited seating available: up to 25 guests per dinner. ** Please let us know of any allergies and dietary restrictions. Click on the date below to purchase your tickets now!